Throughout implementation of OFSDP good number of publications were made. Apart from publication of various OFSDP related documents and guidelines the project published a periodical quarterly newsletter, covering all important activities and developments of the quarter, relating to OFSDP, which was circulated widely. The project entrusted some research studies to eminent scholars and institutions on important forestry, environment and wildlife related subjects and the outcome of these studies were published and circulated. 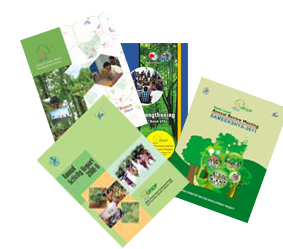 Some of the noteworthy publications include, A Field Guide To The Birds of Odisha by Dr. U.N. Dev, Protocol on Shrimp, Fish and Crab Rearing in Mangroves of Bhadrak District, Odisha by Prof.(Dr.) D. Satapathy, Status Paper on Use of Fly Ash in Forest Nursery & Plantations by Centre for Fly Ash Research and Management (C-Farm), New Delhi, Documentation of Indigenous Traditional Knowledge of Paudi Bhuyans in Odisha by Centre for Biodiversity Conservation, Bhubaneswar, Protection and Conservation of Sacred Groves of Bonai Division, Odisha by Centre for Biodiversity Conservation, Bhubaneswar, Ecotourism: A Biodiversity Management Initiative of OFSDP by Dr. Pratyush P. Mohapatra et. al., Silvicultural Studies on Phasi (Anogeissus acuminata) etc.